Hello All,.. It's that time a year again and it looks like we are going to kick off DreadTober 2017.. If you haven't taken part before and have no idea what DreadTober is let me write out a quick history. At the Nova Open 2015 Greg and I came up with the idea of everyone working on a Dread of some type during the month and keeping track of the progress as a group event that anyone could take part in. This would promote communication and create new friends in the hobby. Joe took it over last year as Greg and I were both wrapped up with life stuff. This year we are all going to coordinate to run it again! 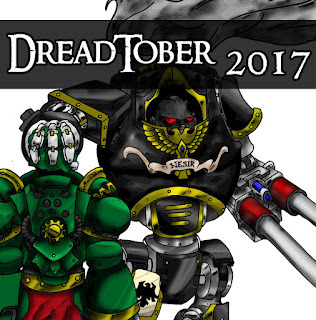 If you are interested in participating in DreadTober hop over to the new Blog we made for it and throw your name in the hat. Hopefully you'll take part and make something awesome! Greg and Joe should also start to promote as well... October is almost here. Almost ready to get dirty..
After the initial annoyance that has been the Sicaran I sat down and got some more work done. The tank is getting close to dirty time. I decided to go with bone stripes .. of a sort. The main body stripe goes from the sides to the center main view area. The second is on the turret and is on the gun guards. I think there is enough secondary color so that is where I'm going to stay. I painted the vehicle and legion numbers keeping the same theme of legion on the front right and the vehicle left rear. I've had a lot of good feedback from the army and people are really liking the weathered look. I've also been asked a bunch of questions on how I do it. So I'm going to try and take progression pics and write up a how to on it .. what I use and the process. It's not too complicated really.. I wasn't thinking about it before I started the chipping but didn't take pics of it. Above I have the chipping fluids I use, The process is pretty simple. Spray your base color and then clear coat it. Let that clear coat dry. Then coat the area with the chipping fluid. Let that dry. Then apply the top color, use some water on a tool like a toothpick or a finger nail and start to chip the color .. this isn't a hard process but it does take some time to get use to make the chips look right. Practice on something you don't care about but chipping the edges of the second color and breaking up a hard line will make it look more realistic. The look I go for is more realistic so take a look at some old pictures of tanks .. Space Marine tanks are made of Ceramite so the tank panels themselves wouldn't actually rust. So I like to keep true to that fact and only rust addon areas like the tracks some on the guns but they are more maintained as they are required to kill in the Emperors name! .. The airbrush work is done and most of the initial hand color work is almost done.. now I need to see what areas I want to add the brass color to. I'll also add some edge highlights to it since when I apply the weathering it will bring down the highest levels. Last week I was working on the Sicaran.. I was blending out the black shades and after doing that I cleared it many times and let it dry for a day. Thinking it should be ok I masked off the area I wanted to have the white line. Well.. when I started to chip the white it was pulling off in huge sheets. That got me nervous.. I had soaked the model and even scrubbed it with a toothbrush and dish soap but it appears that wasn't enough this time. So I had large pieces start to pop off as I removed the tape for the mask. I was annoyed so I cleaned my airbrushes stood up and left the table for about a week haha.. I was pretty bitter. It might not look like much blending on to keep the color black I usually fade from black up to about 30% black and then work back down. It takes awhile but I like the final blend so when it started to pop off I was understandably annoyed 8/ .. Yesterday I did finally get back to it .. I had to actually sand a large area of the model .. going rough and then ultra fine. So now it's mostly back to where I was before the paint popping. The one side still needs more blending to fix the areas affected so once I get that done I can move on to the next step. I'm still trying to figure out how much white I want to add to other areas.. I like the large strip but I think its going to need at least one more section. I'll also be adding numbers and what not like the other tanks. WHooooo's Next? Whooooo wants some? Since NOVA I've been thinking about some of the things I want to work on. I'm going to stick to Raven Guard and Eldar as my armies so I'll be unloading more of the old armies I have that I don't plan to play or work on. I was working on the Dusk Wolves but after moving my display cabinet I really started looking at them and I think they are going to get retired and some stuff even getting a repaint. So anyway.. this year what am I going to be working on .. this is the list I came up with quickly..
- Sicaran Battle Tank -- the original one.. Everyone asks when I mention it haha..
Whoever designed the flash connection points on the side .. I hate you a bit man.. to not destroy the rear tracks I was sawing, cutting and sanding for like an hour on those few pieces. I had an amazing time at Nova this year and I originally I thought I'd be RG burned out but winning some of the painting things got me motivated so there are some things I'm going to work on 8) I also want to add some pieces into my lists that will help against Drop Pod lists.. I don't give a poo about a W or L but against DPs I really stood no change and I want the game to at least be a game haha..
- Wraithseer - I've had this guy for years and always want to work on him but this year he needs to get done. At NOVA I was talking to Mark H and he gave me an idea I might go with for the coloring of the model. - Flyer - Love them ..
- Yvraine - I might play around with some free hand on the cloak.. I haven't updated the look or pages on the blog in awhile so that's going to happen.. removing some of the armies and updating the tools and links lists.. I have some other things in mind but we'll see as the year goes on..
Short post today just wanted to upload the pictures I took.. Sadly it's not a ton and I missed a lot at the Cap Palette .. it seems like as soon as I started to take pictures I'd start talking with someone and then had to head off haha .. so .. sadly I didn't get many of the Cap Palette entries.. This weekend past was the payoff for all of the work I've been doing for the past six months. It was honestly the best gaming experience I've had at NOVA. The 30k crew was awesome and honestly I can't even remember how my win loss total was.. it didn't matter. I met and hung out with so many people this year it was wild. Sadly again I think I think I played too much doing the team game and then the Big Blam that night and it pretty much crushed me haha.. But it was awesome playing on beautifully painted tables with great armies.. all of the events were fun and had some craziness too! I got a ton of great comments about the army and the displayboard! It was awesome chatting with people about it and talking with people about their armies.. There were many and awesome looking. I won the Best Appearance for the Opening Salvo event and that was very cool! I also for a RAD army badge haha.. which looks like a RAD grenade.. nice. I entered the Imperial Knight and Fellblade into the main painting Comp - The Capitol Palette and scored a Silver and Bronze metal which took me completely by surprise. I usually just hope for finalist.. when they read out the names for the finalists and I wasn't on there I was thinking damn... I didn't make it to the final round. But when they started calling our the medals I had scoured a Bronze for the Fellblade and Silver for the Knight. Greg who was sitting next to me said my face was great.. I'm sure it was a mix between stunned and excited haha.. honored to have placed. The swag and awards for nice .. I got 2 Contemptors and Termies.. sadly .. I don't think they really fit in the Raven Guard I'm making. Neither really seem stealthy haha.. All good, I'll figure something out to do with them. I did breakdown and pick up a Sicaran Battle Tank at the Forgeworld booth.. I have always loved the look of them but wanted to see one in person. Seeing all the ones on the table of the 30k events made it a lock. And no it's not a new version.. it's the original .. I know you were thinking the new one? Every time and said I picked it up the next question was the new one? EVERY TIME.. haha..